Welp, there you have it Bachelor fans. Becca has found true love with... (Shhh, no spoilers just yet). Now what? You probably have an empty Monday night void to fill because for the past 12 weeks you've been living vicariously through Becca as she wanders through her journey of love. Not that it hasn't been great but if you''re like me, and I'm sure we're not too far off from one another, you've neglected all your hobbies in the meantime. If you're having a hard time picking back up your hobbies, try one of these activities. They're bound to make you feel somewhat motivated. 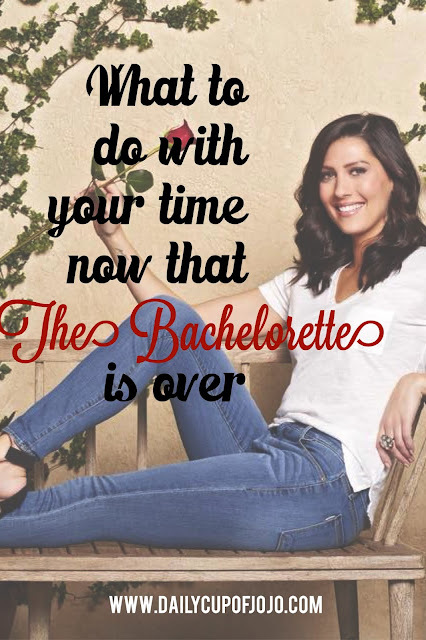 At least until the Bachelor season starts up again and we can recycle this process. Eat, Sleep, Bachelor, Repeat. Even if you're not in the market for a new job, it's always good to keep things accurate and fresh. You never know when opportunities may come knocking. Bachelor in Paradise is up tonight and if you've tuned into any part of the bachelorette/bachelor shows in the past year you will for sure see some familiar faces. Chris Randone, whom we thought was one and ranDONE, while Krystal and Tia from Arie's season have another shot at love! Maybe BIP (Bachelor in Paradise) isn't your thing, the proposal which was the show immediately following The Bachelorette this season is a decent half hour of your life you won't get back but won't regret either. Anybody else guilty of neglecting the grandparents because they're not up to date with the newest technology? My grandparents just upgraded from dial-up, so its hard for me to remember to call them because everyone else is on Facebook or Instagram; they know what is going on wiht my life. Grandparents arent always so keen to that. Seriously, anything. Alphabetize (or color coordinate) your books. Inventory your closet, DIY a desk, do your laundry and unsubscribe from any emails that serve you no purpose (Sayonara, Starbucks emails). There are plenty of things that could and probably should be done around the house. This is a perfect hobby in the meantime because it will take up just as much of your time as the bachelorette did but you can save money in the progress. It's almost like a two-for-one because you can clip coupons while watching some new reality show you picked up between bachelor seasons. SEE! You're already saving! Honestly, didn't even know this was a thing until about two weeks ago. It's called the NATO phonetic alphabet (Alpha, Bravo, Charlie...) Next time you need to spell something out over the phone you'll nail it. There worse ways to spend your time. My hardest thing is I can never figure out where I want to go. I'll spend 2 hours researching places and activities to do. If I could have this figured out for the next time I want to go somewhere then that's half the battle down. Take the girls or your boo out for a weekend getaway. Set a budget and plan everything. Seriously. They are the cutest animals you will ever see. I recommend videos of them eating too! WARNING: Do Not get the spelling wrong, because this could turn south really quick. If you're worried. Start with my Pinterest board. That's safe! I promise. Come on, we all knew it was going to be Garret from the get-go didn't we? Now all we need is Blake to be the new BAchelor! He's a total Ben Higgins 2.0. I am cracking up at this post! But also, totally agree with updating your resume. A trash TV recommendation: Southern Charm on Bravo, I love it.